Children and French bulldogs are a natural combination, but children should always be taught to be gentle with their new puppy or adult Frenchie and parents should always supervise interactions. All children past crawling stage can participate in care in some fashion. A toddler can pick up toys and put them in a box, help straighten bedding, and learn to keep his own toys out of range of your French bulldog’s teeth. A pre-school child can do these things and help fix meals and accompany Mom and Frenchie to the veterinary clinic. 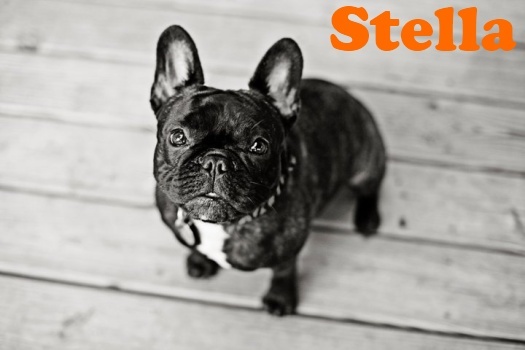 A kindergartner can help teach your French bulldog to sit before he/she gets a treat and can help with leash training, and an older child can teach tricks and actively participate in good manners training under adult supervision. Read easy-to-understand books about pet care, safe handling, and dog behavior to your children prior to getting your French bulldog. Discuss what you have read with your children. Demonstrate how to properly handle a dog by using a stuffed toy dog. Have your children practice with the toy animal. Have a family meeting and set the ground rules for your French bulldog puppy. Children need to agree to follow these rules before and after their new Frenchie comes home. Make your French bulldog his/her own little home-within-a-home as a safe haven. Involve children in setting-up this space. Pick a warm, comfortable location for your French bulldog’s crate. Enclose an area around it with an exercise pen or cardboard, and line the area with newspapers and a pee pad. Place toys, bowls and bed in this area. Keep very young children and pets separated. ALWAYS supervise small children and pets. 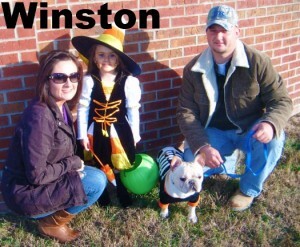 Be sure that older children are treating your pet appropriately. When your puppy and kids meet for the first time, it should be done in a calm manner. An adult can hold your French bulldog while children slowly and quietly approach and allow your puppy to smell the back of their loosely closed fist. Then they may gently pet your French bulldog. Children must not be allowed to hurt or roughly handle your Frenchie. Don’t allow them to pinch or poke your puppy or pull your French bulldog’s ears or tail (if they can grip it. tee-hee). Be careful not to let them step on or drop your puppy, or to squeeze him/her “too tightly”. A pupy held close to a child’s face can accidentally scratch or nip if it becomes frightened and tries to get away. French bulldogs may be afraid of squealing, yelling, running stomping children. Keep your French bulldog in their own space when the kids are running, or have them play quiet games when our French bulldog puppy is out. Children should not play chase with your French bulldog — regardless of who is chasing whom. Kids should never be allowed to drag your French bulldog around by the leg, the collar, or a leash. Teach children not to sneak up behind or startle your Frenchie and to leave him/her alone when he/she is eating, resting or sick. Pets and kids should be separated when food is around so puppies don’t become beggars and thieves and kids don’t tease pets with tasty morsels. Do not make a young child responsible for your French bulldog’s care. 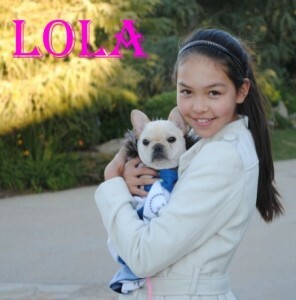 When children are old enough then involve them in your French bulldog’s daily care and overall training. Teach children to nurture, love and respect all pets; teach them by example. From your French bulldog’s point of view, children can be either easy to intimidate or objects of fear. Children who run and scream can excite bold pet’s into uncontrolled madness that includes growling and biting or can induce fear in shy pets. Children who try to dominate pets can turn a pet into a biter, and children who are afraid of the pets can turn them into a bully that growls and nips to get his/her way. 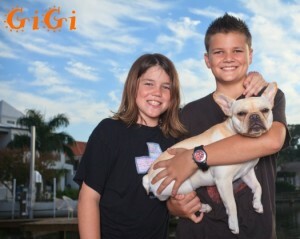 Keep in mind that our goal is for our French bulldogs to to Happy, Healthy, Social and Friendly. These are rules of thumb that we follow in our home. If you do the same you will adore your new Frenchie and they will love you right back. French bulldogs aren’t known for aggressiveness…more for being stubborn so please just teach your children to be kind, gentle and respectful and your French bulldog will be their lifelong loving companion!